Looking for products with turmeric? Whether you are experiencing sore hips or knee pain from hiking, an injury such as a twisted ankle, or just a bad headache, there are certain foods you can eat to ease the pain. In Outdoor Herbivore's Food RX, you’ll find a list of foods that contain powerful anti-inflammatory compounds to help counteract inflammation and soreness in the body. Ever wonder why prepared mustard is yellow? The color comes from the spice turmeric. Turmeric, a member of the ginger family, is a golden yellow root that is native to India. It is commonly dried, ground into a fine powder, and sold as a spice. It has a long tradition for its healing properties, use as a seasoning (especially in Indian curries), and as a skin dye for important ceremonies. Turmeric is a complex medicinal food which contains many known active beneficial constituents. Turmeric contains a mixture of phenolic compounds; the chief one is curcumin, a very powerful anti-inflammatory substance. This compound inhibits cyclooxygenase-2 (COX2), an enzyme in the body that becomes elevated with inflammation, especially from joint pain and stiffness caused by arthritis. In fact, some people find turmeric capsules offer better relief for their osteoarthritis than the drug Celebrex. For pain, curcumin has been shown to be just as effective as Ibuprofen, but without any toxic side effects. Common OTC non-steroidal anti-inflammatory drugs (NSAIDs), such as aspirin, ibuprofen and naproxen can cause adverse gastrointestinal side effects, increased heart failure, or inhibited blood clotting. Turmeric has no such side effects. Curcumin is also an antiviral and helps speed up the healing of wounds. You can dab it directly on a wound as an antibacterial before adding a bandaid. Turmeric may provide further pharmacological benefits. It has demonstrated positive results for preventing health conditions such as Alzheimer’s, MS, and cancer. Research is underway to study how these complex synergistic interactions work together to make it such a valuable herb. Turmeric spice has a warm aromatic zest and a mildly bitter and peppery flavor, reminiscent of ginger. 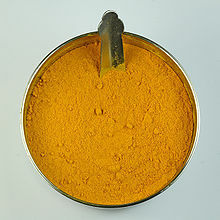 Add about one teaspoon per day of powdered turmeric with food. Increase your intake by adding an extra squirt of mustard on sandwiches. Start sprinkling turmeric spice on rice, soups, pasta, eggs and potatoes. Add it to hot teas. Add turmeric with black pepper to enhance the absorption of curcumin. For more severe pain, add up to 5 teaspoons of turmeric per day. ​Where do most Hikers Resupply on the PCT? Some of your meals contain a salt packet. Does the sodium content listed on your nutrition facts include the salt packet?